This page is an idea for adding LoRa capability to a bat box. 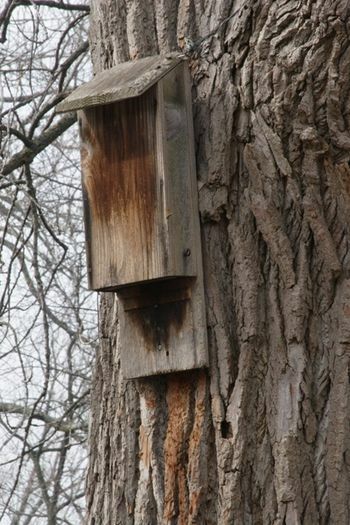 A popular kind of bat box is a flat wooden box with an opening on the bottom and mounted to a tree trunk or building. Bats can use these to sleep during the day (they hunt at night for insects). Some kinds of bats can even use a bat box to raise their young. To check if a bat box is in use by bats, you can walk up to the tree that the box is mounted on and shine a light into it to see if there are any bats there. But I think it would be nice to investigate if this can be done automatically, without having to go to the individual box and without disturbing the bats with a light! The basic idea is to mount some piece of electronics in or on the bat box that monitors if there are any bats in there. Periodically (say once a day), the presence of bats is broadcast using a LoRa (long range) radio transmitter to a central place (e.g. the internet). To sense the presence of bats inside the bat box, I plan to use a PIR (passive infrared) detector module which can detect movement of warm bodies. A PIR typically has a low current requirement (say < 0.1 mA), so it can probably be turned on most of the time. Sleeping bats will likely not trigger the movement detection, but that's OK I think, knowing when they enter or leave the bat box is probably enough info. I ordered a couple of different mini PIR sensors, so I could do some measurements on which PIR sensor is the 'best', meaning good sensitivity and low quiescent current. The table below shows some of the properties I measured, including the supply current. Some sensors use a little more when activated, but this was so little that I didn't write it down separately. Also, all sensors I bought seem to have an internal regulator, so every one was fed with 5V, which is then down-regulated to some lower voltage on board the PIR module. This can be a problem because I plan to use a single lithium cell so I have only about 3.2V available. USD 2.19 < 50uA 1 mA 7144 (4.4V) probably worst candidate: high idle current, weird pitch (2mm?) connector, not 3.3V compatible! USD 1.75 <60uA 75 uA 7133 (3.3V) aka HC-SR505, it looks like it misses a some part connecting to the OUT pin! 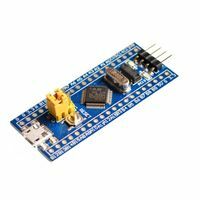 In relation to being 3.3V compatible, here's a guide on modifying a PIR module for 3.3V. I think the LoRa radio technology is perfectly suited as a transmission medium for sending the bat box occupancy data. LoRa has a larger range than similar radio technologies, has relative immunity to narrow-band interference and allows for low-power transmissions. There are already several LoRa gateways provided by the-things-network (TTN) that can receive and forward the data for free (no subscription needed, fair-use policy). If the LoRa network is down for some reason, no harm is done to the bats, possibly just a few days worth of data lost, and I think I can come up with a solution to that. To power the electronics, I plan to use a LiFePO4 battery. A battery of this type has a voltage of around 3.2V, so it is capable of running the electronics directly, without a voltage regulator. It also has a quite large capacity (mAh per gram) and is relatively safe (doesn't catch fire easily, unlike some other lithium battery types). The basic idea is to indicate whether movement was detected within intervals of 15 minutes. So each day the electronics see 96 such intervals (24 hours, 4 intervals per hour). Encoded using 1 bit per interval, we can send the result of one day in just 12 bytes (excluding overhead from the LoRaWAN protocol, about 13 bytes and our own overhead, e.g. a time stamp). If movement is detected by the PIR, the processor is woken up, it notes the movement in internal memory and turns off the PIR so it can sleep for the remainder of the 15 minute interval. This way, we conserve the maximum amount of energy in the battery and make it last as long as possible. (idea: use a solar panel to recharge). Once a day, at some random time, the bat box sends all the data collected so far to the network application connected to the TTN. when the bat box receives the down-link transmission, it updates its clock with the correction offset. So, for example if a bat box powers up with no knowledge of the time at all, it'll start at UTC time 0. The network application will note a huge time error and prepare a down-link message with the correct offset. When the bat box receives the down-link message, it applies the offset to its clock and so updates itself to the correct time. It doesn't really matter how much time there is between an up-link and a down-link or when the down-link message is scheduled exactly, since the network sends a time *difference*, not an absolute time. Down-link messages are only sent when there is a large time error, so they should be relatively infrequent, reducing the network load on the TTN. consider adding some kind of test signal, to verify the behaviour of the PIR, perhaps light a bulb once a day for a few seconds? measure other properties of the bat box, like battery state (voltage), temperature and relative humidity. Once the whole data chain is set up, this should be easy. This page was last modified on 5 November 2017, at 10:12.